Parents may think their child is a good athlete, but where’s the proof? 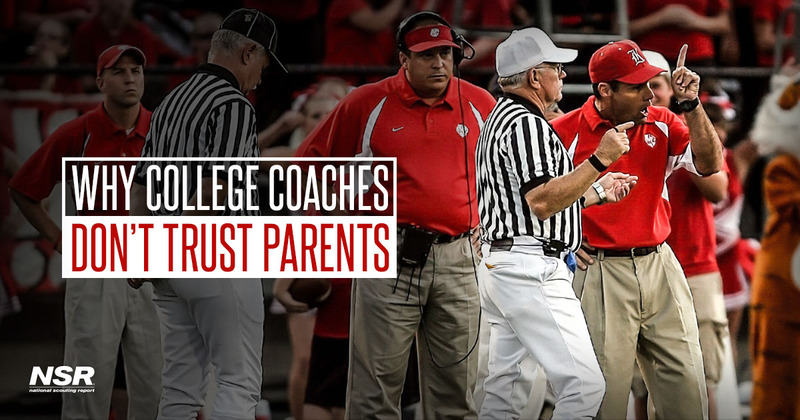 The main reason college coaches don’t trust parents about their kids? It’s difficult for parents to be realistic and objective concerning their child’s abilities and skills. Many parents believe their child is the best athlete on the team and will be the next college All-American. Knowing this, college coaches do not put much credence in the information they receive from parents and high school athletes. Some college coaching staffs receive as many as 25,000 emails per month from athletes, parents and high school coaches. Parents who enroll their children with National Scouting Report often save tens of thousands of dollars in the end. The chances of the one package you send coaches being opened is minuscule. And when you get no response from the coach and decide to follow up with a phone call, your chances just got worse. In fact, you may have caused a minor NCAA rules infraction. Insider tip: learn about the NCAA rules and how to avoid making a costly mistake by clicking here! Yes, there are professionals who deal with college coaches every day. Find out which ones are the real deal, have been around a long time, have the respect of coaches and get results. When your kid broke a bone, did you try to set it yourself? Point made. No doubt, you can go at it alone. Rarely does this work. Recruiting is a relationship-driven process. It is usually the relationship and the college coach connections that yield athletes the very best offers. A well-connected scout can help a family save tens of thousands of dollars in educational costs. It is well worth getting a professional college scout to evaluate and scout your child.